Distinctly harmonious, elegantly refined and recognized the world over as the gold standard in fine Champagne, Dom Perignon always makes an exceptional gift. Accompanying Dom is the highly-regarded Groth Cabernet and a menu of sweet and savory delicacies including chocolates, cheese and more. Arranged in a lavish gift basket, this gift is the epitome of luxury. One bottle of Dom Perignon Brut Champagne and Groth Napa Valley Cabernet. Luxury Chocolate from Godiva, Ghirardelli, Weinrich and Lindt. Chocolate Balsamic Strawberries, Cinnamon Almonds and more. Each gourmet item is carefully assembled, and the gift is accentuated with a hand-tied satin ribbon. An attached card bearing your personal message or greeting, as well as complimentary scissors for easy opening are both included in this gift. 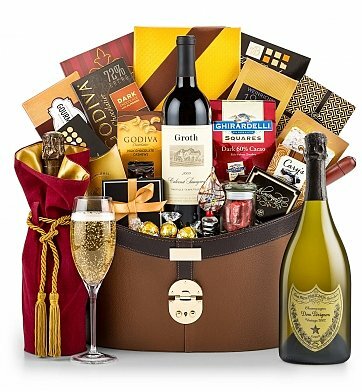 Your gift will leave a lasting impression as they continue to use and enjoy this elegant keepsake hamper with contrasting trim. Measures 15" x 12" x 9". Epernay Experience with Dom Perignon is a hand delivered gift. These gifts are delivered by one of our local design centers located throughout the United States and Canada. Same day delivery is available for most gifts when ordered before the cutoff time. The cutoff time for Epernay Experience with Dom Perignon is 1 PM in the recipient's time zone. Chocolate Pomegranate Cream TrufflesA chocolate pomegranate cream center is enrobed in rich milk chocolate, creating a decadent truffle that's exclusive to GiftTree. Dom Perignon Vintage ChampagneThe world-renowned Champagne produced from only the finest grapes. Powerful, chiseled, and timeless, with notes of almond, powered cocoa, white fruit and hints of dried flowers. Lindor Milk Chocolate Caramel Truffles by LindtSmooth and luscious caramel is surrounded by a decadent milk chocolate shell in this premium truffle. Rutherford CamembertA velvety white cheese with a rich, buttery flavor. Perfect with pretzels or serving on savory crackers. Decorative Glass Wine StopperHandblown glass and stainless steel wine stopper, artisan-made to be long lasting and durable. Groth Napa Valley Cabernet SauvignonA bounty of ripe fruit on the nose and palate plays well with the subtle vanilla character derived from nearly two years on oak. Olive Oil and Sea Salt Crostini d'ItaliaItalian for "little toasts", these crisp, savory crackers are blended with authentic coarse sea salt and extra virgin olive oil. Try them topped with cheese, vegetables, dips or cured meats. Produced from Pinot Noir and Chardonnay grapes from the finest growths and vineyards, Dom is created only in years in which the harvest is precisely suitable. Fragile, timeless, and immeasurably enjoyable with aromas of almond, powdered cocoa, and dried flowers leading to a precise, chiseled palate. Toasty notes give a rounded finish and denote a fully realized maturity, while on the palate, the wine instantly traces an astoundingly fine line between density and weightlessness. Its precision is extreme, tactile, and dark while the full taste lingers with the utmost elegance on a sappy, spicy note. Groth offers a classic Oakville Cabernet, with the plush silky texture typical of the appellation. A bounty of ripe fruit on the nose and palate plays well with the subtle vanilla character derived from nearly two years on oak. Dom Perignon Brut Champagne and Napa Valley Groth Cabernet Sauvignon. Arrives presentation-ready in our signature keepsake basket. Includes a complimentary attached card with your personal message.